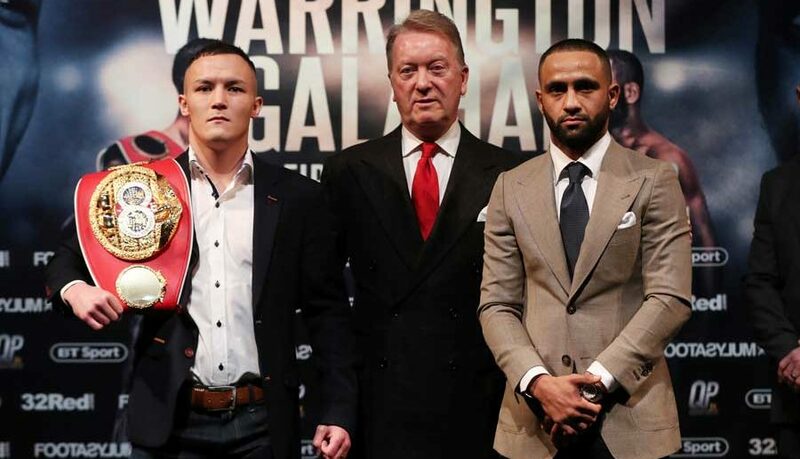 JOSH WARRINGTON will make the second defence of his IBF world featherweight title against mandatory challenger Kid Galahad at the Leeds Arena on June 15th. It will be a hometown return for Warrington in the all Yorkshire grudge match against his old amateur rival. 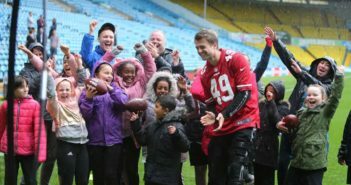 Warrington, 28, caused a big upset when he outpointed defending champion Lee Selby in front of 25,000 fans at Elland Road, home of his beloved Leeds United last May. In December, he cemented his status as one of the boxing stars of 2018 with a thrilling points win against two weight world champion, Carl Frampton at Manchester Arena in his maiden defence. 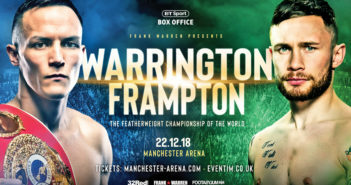 Warrington (28-0) had being eyeing a unification clash against WBO champion, Oscar Valdez but the IBF ordered him to face Galahad and purses bids were won by the champion’s promoter, Frank Warren. Galahad (26-0) was born in Qatar but lived in Sheffield for much of his life and learnt his skills under the tutelage of the late Brendan Ingle. He is now trained by Brendan’s son Dominic. 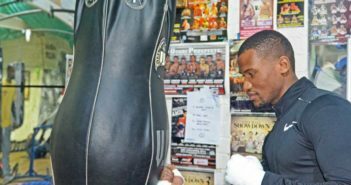 He became Warrington’s number one contender in October when he outpointed Toka Kahn Clary on his American debut in Boston in an IBF final eliminator. Galahad, whose is also known as Barry Awad last boxed in December, easily outpointing Brayan Mairena over eight rounds. Warrington, a former English, British, Commonwealth, European and WBC international champion boxed Galahad twice when they were amateurs winning both contests on points. He said: “All of sudden people are saying I am capable of beating every featherweight in the world and with that comes expectation. “I will go into this fight as the bookies’ favourite, but I will be 100 per-cent focused and looking to do a job. “I knew Barry when we were amateurs and he was always a decent guy, but over the last few years he seems to have changed and put on some persona to blag fans, opponents or himself. “He did well at super-bantamweight, but he has beaten nobody as a featherweight and he has lost respect from me for some of his antics. “I want to be Ring Magazine champion, own all the belts and they are in touching distance. I can beat all the featherweights. Galahad won British, European, Commonwealth and international titles at super-bantamweight, and an IBF Intercontinental featherweight belt. Galahad, 28, said: “Josh’s biggest asset is that people underestimate him and he is a lot better than what he looks. “He’s strong, tough, durable and mentally strong, but I have the skill, will and mental toughness to beat him. “He beat me fair and square when we were amateurs, but down the line I knew I would always fight him again. This is professional boxing, different game. “Why am I the man to beat him? I know mentally that I am on a different level and I have the best team in British boxing. Warrington snapped back: “That prediction makes me giggle. It is funny how these scenarios get drawn up. He isn’t in touch with reality and talking daft. It is playground stuff. BT Sport have the live and exclusive TV rights for Warrington v Galahad in the UK.